Injuries and employer misconduct occur more often in the construction industry than you may realize. And those who violate safety protocols aren’t only the small businesses no one’s heard about. In the day where OSHA is cracking down on companies harder than ever before, it is a mystery why any business would try to pull a fast one on authorities. Especially top names like Amazon. According to a report made by OSHA, an Amazon warehouse in New Jersey forced employees to stand for the entirety of their 10-hour shifts. They also failed to report 26 work-related illnesses and injuries. An Amazon spokesman disagrees with the alleged accusations, but the full report of employee citations suggests otherwise. 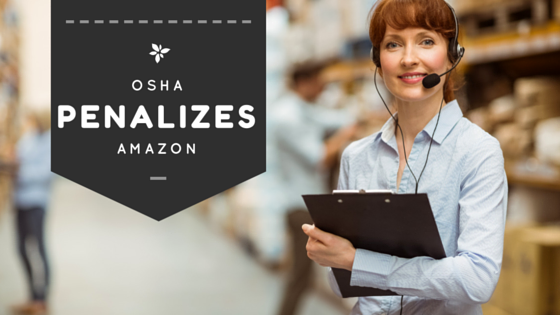 OSHA’s investigation began in July of 2015 for this particular warehouse, but Amazon has been receiving criticism for their working conditions in recent years. The Amazon warehouse in New Jersey has been fined $7,000 for the charges. Due to the increasing number of employee injuries and inadequate safety protocols, OSHA will be implementing a few new rules in 2016. They will also be increasing fines. Their goal is to try and reduce the number of injuries on the worksite, improve overall safety, and to prevent employers from leaving out important information and not reporting incidences properly. Electronic Record-Keeping. OSHA will be adding to an already existing rule regarding electronic recordkeeping, and will work to require that businesses with over 250 or more employees will have to electronically submit illness and injury reporting on a quarterly basis. This proposition will hopefully be a final rule no later than March 2016, and will directly affect large warehouses like Amazon’s in New Jersey who employs 2,500 employees, to more effectively prevent workplace illnesses and injuries. Ban “Health Incentives.” Many companies and warehouses create a “health incentive program” as a way to actually discourage employees from reporting illnesses and injuries. Some examples of these programs include: making employees who report an injury or illness wear fluorescent vests; disqualifying employees who report two injuries or illnesses from their current job; requiring an employee who reports an injury to undergo drug testing where there was no reason to suspect drug use; automatically disciplining employees who seek medical attention; and enrolling employees who report an injury in an “Accident Repeater Program” that includes mandatory counseling on workplace safety and progressively more serious sanctions for additional reports. Silica and Beryllium Exposure. The new agenda states that OSHA plans to issue a final rule with heightened standards concerning silica and beryllium exposure. The combined potential of saved lives if both these rules should pass would be about 800 annually. OSHA may try their best to do all they can to improve workplace conditions, but not every proposed rule gets passed as planned, and bureaucracy can cause rulemaking to drag out. You can educate yourself right now on the correct safety procedures, including OSHA standards, and help to improve the safety of your workplace by completing quality training, like the New York forklift certification from CertifyMe.net. Their online program is very affordable, 100% OSHA compliant, and takes about an hour to complete. It only takes a small change to make a big impact, and you can help encourage others to raise the bar on workplaces and warehouses nationwide.